Maputo — Mozambique's main opposition party, the former rebel movement Renamo, on Wednesday denounced fraud in the current municipal elections in the town of Maganja da Costa, in the central province of Zambezia. He said that a Renamo supporter was confused with a Frelimo member, and received three ballot papers. "When he protested, saying he had received three papers, they apologised, saying it was a mistake", said Majibire. When Renamo polling station monitors tried to protest to the police, they were beaten, he claimed. "There are no observers in Maganja da Costa. This is the beginning of fraud", Majibire declared. This type of fraud has been independently confirmed, though not yet in Maganja da Costa. Two polling station chairpersons have been arrested for handing out extra ballot papers to voters, and are currently being held by the police, according to a report in the "Mozambique Political Process Bulletin", published by the anti-corruption NGO, the Centre for Public Integrity (CIP). One of the arrests was in Massinga, in the southern province of Inhambane, and the second was in Mozambique Island, in Nampula province in the north. In both cases, the fraudulent behaviour was detected by Renamo monitors. Similar fraudulent behaviour has been reported from Angoche, in Nampula, and a correspondent of the Bulletin took a photo of four ballot papers, already filled out, in the possession of the polling station chairperson. This type of fraud should lead to a statistical anomaly - the number of ballot papers in the ballot box will be larger than the number of names ticked off the voter register. But dishonest polling station staff can cope with this by waiting until late in the day, when there are no more queues, and then ticking off additional names on the list. 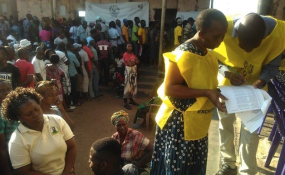 Majibire also claimed that truckloads of people had been intercepted in the northern port city of Nacala, intending to vote in that municipality although they live in other parts of the country. "In Nacala, an eight tonne truck full of nurses and other state functionaries was surprised", he said. "They were coming from other districts to vote for Frelimo". This would be a very difficult fraud to pull off. Each voter is registered in a particular polling station and cannot vote anywhere else. The name on his or her voting card, or other identity document, must coincide with the name on the polling station register. According to the Bulletin, Renamo has detained two people whom it claimed were voting illegally in Nacala. But the two were properly registered to vote in Nacala: Renamo's only evidence against them was that they had identity cards giving their addresses as Mossuril and Nacala-a-Velha districts. This proves nothing at all, since people often carry outdated identity cards with old addresses, months or years after they have moved somewhere else. And even if these two individuals did register illicitly in Nacala, Renamo has no power or authority to detain them. A serious problem has arisen with anomalies in the voter registers. There is a register for each polling station. One copy is used by the polling station staff, and the names of those who have voted are ticked off on this register. A copy of the register in electronic form is in the hands of staff outside the polling station who use it to help voters find their correct polling station. Copies were also sent to all parties competing in that municipality. All these copies of the register should be identical - but they are not. This became glaringly obvious when the Mayor of the central city of Quelimane, Manuel de Araujo, tried to vote and found his name was not on the register used by the staff. But it was on the register sent to Renamo. A similar situation arose in the town of Gurue. The Renamo mayoral candidate Adriano John was not on the list. But he was certainly registered as a voter and issued with a voter card, otherwise he could never have become a candidate. The Bulletin's correspondent in Gurue reports that 500 names were left off register books in three polling centres. In the Nhamayabue municipality, in Tete province, voters found that their names were not on the list used by the staff, but were on the staff computer. Alarmingly, there are reports that local officials of the Electoral Administration Technical Secretariat (STAE) are confiscating copies of the registers held by the political parties, although their possession of these documents is entirely legal. The parties were given an electronic version of the register and in many cases printed out hard copies for their polling station monitors. It is these hard copies that are being confiscated. Majibire claimed this was happening in the northern city of Lichinga, and throughout the southern province of Gaza. Bulletin correspondents confirmed that the confiscations are happening in the Gaza provincial capital, Xai-Xai, and in Dondo, in Sofala province. When AIM asked STAE spokesperson Claudio Langa about this at lunchtime, he said that no such reports have reached STAE headquarters in Maputo, and there were no instructions from STAE centrally to confiscate registers.